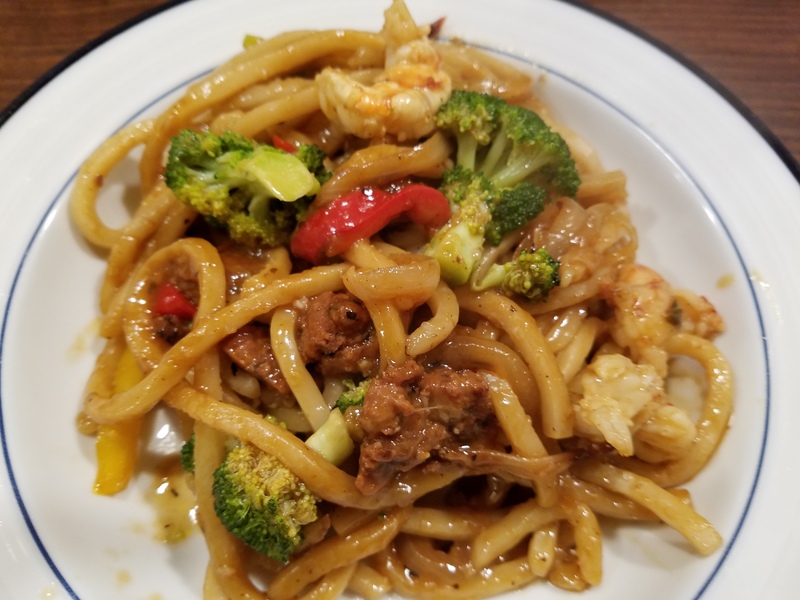 I love, love noodles.. here is another yummy recipe. Mix the pork, tamari, garlic, ginger and shaoxing wine and marinate for 2 to 3 hours. Keep aside. Heat a wok with peanut oil and add the Szechuan peppercorns. Saute for 20 seconds on medium heat and add the ground pork. Cook on high heat stirring and breaking the meat apart with a wooden spoon. Saute for 5 to 6 minutes or till golden brown. Take the meat out and add some more peanut oil and add the mushrooms. Saute on high heat for 3 to 4 minutes. Add the bok choy whites and cauliflower and sauté for 4 to 5 minutes on medium heat. Add the meat, noodles, sauce and chicken broth. Bring to a boil and cover on a simmer to cook the cauliflower through. Check for seasonings and garnish with bok choy greens. 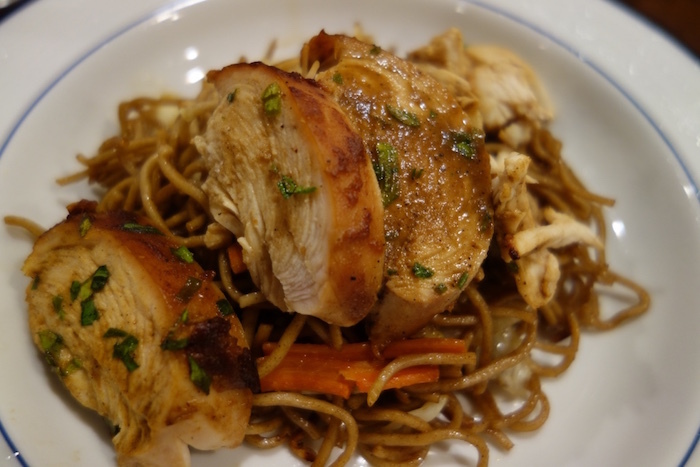 I modified this recipe from NYT cooking section.. it is a yummy one. 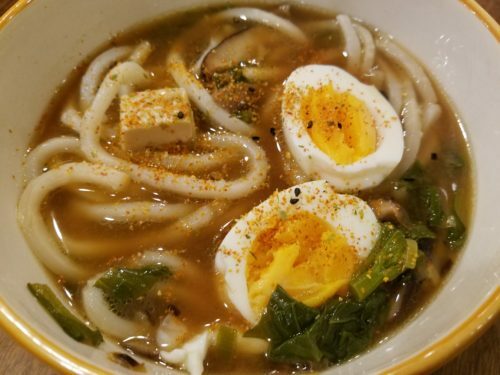 I added a boiled egg as an egg makes everything more yummy! Mix the dashi powder, mirin, soy sauce, chicken broth and corn starch in a small bowl and keep aside. Heat a wok like pan with the oil and add the shallots. Saute on high heat for a minute. Add the mushrooms and sauté on high heat till golden brown, about 3 to 4 minutes. Add the white parts of the bok choy and sauté for 2 to 3 minutes. 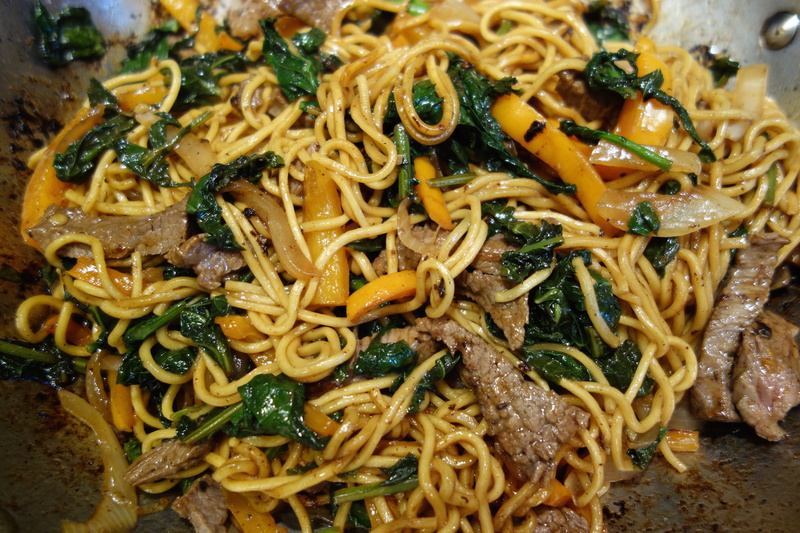 Add the bok choy greens and the cooked noodles. Saute for a minute and the sauce. Bring to a boil and stir well. Taste for seasonings and garnish with green onions. Add the garlic and salt into a mortar and pestle. Pound till the garlic and salt are mixed well. Add the cilantro and oil and pound and mix till a paste is formed (this can be done in a food processor). Spread the paste all over the shrimp and marinate for 4 to 5 hours in the refrigerator. Heat a large wok like pan with the oil. Add the onion and garlic and sauté on medium heat for 2 minutes. Add the soba noodles and greens. Saute for another minute and add the tamari, Worcestershire sauce and sweet chili sauce. Mix well and check for seasonings. Skewer the shrimp and broil in the oven 3 to 4 minutes on each side or till done. Careful not to over cook the shrimp. Take shrimp off the skewers and serve on top of the noodles. Meatless Mondays have never been yummier! 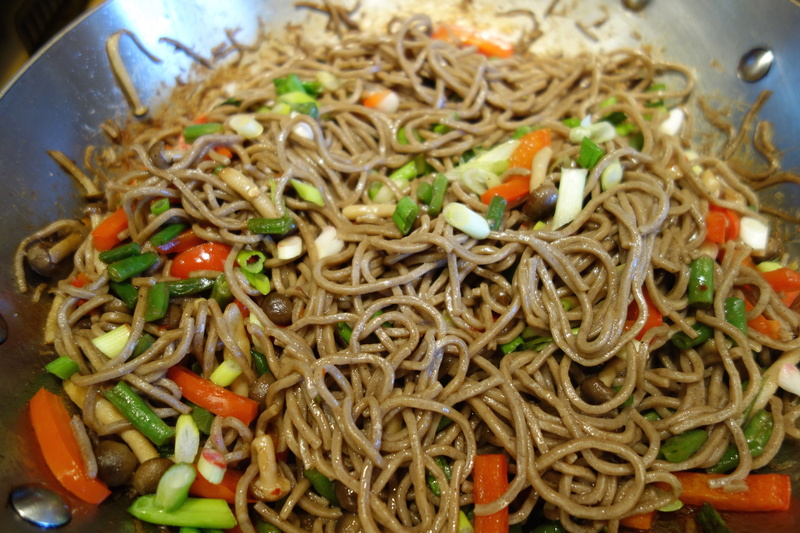 These easy to make soba noodles are a crowd pleaser- no one will notice how healthy they are! I would eliminate the dashi to make it a 100% vegetarian! Heat a wok like pan with the peanut oil. Add the mushrooms, green beans and red peppers and sauté on high heat for 3 to 4 minutes. Add the cooked and drained noodles and sauté for another 2 minutes. Add the sauce and bring to a boil and mix well. Taste for seasonings and add salt and pepper accordingly. Garnish with green onions and serve. Mix the tamari, mirin, oyster sauce, Worcestershire sauce, ketchup and sugar in a bowl and mix well. Transfer the beef slices to a mixing bowl. Add 3 tablespoons of the sauce, corn starch and sesame oil to the beef. Mix well and marinate for 2 to 3 hours. Heat a wok like pan with the peanut oil. Add the marinated beef strips and sauté on high heat for 2 to 3 minutes. Take out of pan and add more oil if needed. Reheat the pan and add the pepper and onion. Saute for another 2 to 3 minutes and add the Chinese broccoli and sauté for 2 to 3 minutes. Add the noodles and the rest of the marinade. Mix well and check for seasonings and serve. Heat a wok like saucepan with the peanut oil. Add the crumbled sausage and sauté on medium high heat for 4 to 5 minutes. Add the onion and garlic and sauté for 3 to 4 minutes. Add the broccoli and cook for 3 to 4 minutes. 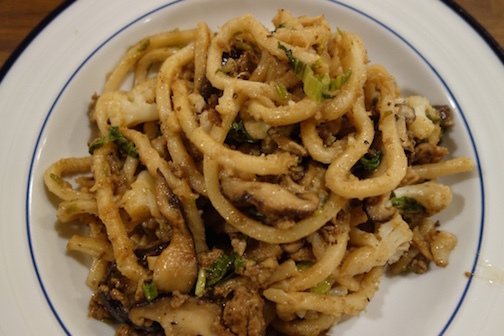 Add the udon noodles and sauce. Bring to a boil and add the shrimp. Mix well, cook for another 2 to 3 minutes till the shrimp is cooked through, adjust the seasonings and serve. Mix the ingredients together and keep aside. Heat a wok like pan with the peanut oil. Add the mushrooms and cook on high heat for 3 to 4 minutes. Add the onion, carrot, green onions and cabbage. Saute for another 3 to 4 minutes and add the cooked noodles. Mix well and add the sauce. Mix well and cook for another 3 to 4 minutes. Check for seasonings and serve.